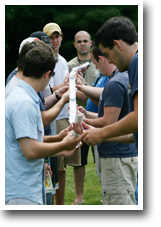 Collegiate Members - LEAD Program - Team Building - Sigma Nu Fraternity, Inc.
Why teambuilding? Because we learn better by doing, when we are having fun, and when experience is shared among individuals. 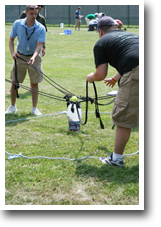 Teambuilding refers to a host of activities, exercises, games, and initiatives that lend themselves to: introducing groups and individuals that are not familiar with one another, breaking up monotony; building trust, respect, and communication among individuals and groups; and creating bonds that promote future cohesiveness and effectiveness. Sigma Nu's Teambuilding Guide contains nearly 70 activities for chapters to use at retreats, meetings, LEAD sessions, and brotherhood events. The guide includes facilitation tips, suggested audiences and events to use teambuilding with, and discussion questions to translate experiences to improvements in the chapter. The teambuilding activities shared here are only a small sampling of what Sigma Nu chapters, colonies, members, and alumni can use to create experiential learning opportunities. The guide provides tips on facilitating activities; selecting activities for specific audiences and events; addressing key themes like communication, trust, and problem-solving; easy to follow instructions; and discussion guides to process teambuilding experiences.